"The goal of the program is to find those veterans who are wanting to get into manufacturing and to teach them the skills necessary to become a well rounded machinists," Program Coordinator Doug Bowman said. The university says there is an extreme demand for workers with these skills in the machining industry. It's a demand they believe can be met, With the help of unemployed veterans. "What we've done through this program is match up a population of people that has a higher than average unemployment rate, who are also great employees, with a set of employers who have a need for trained employees," David Tucker Vincennes University Vice President for Workforce Development said. 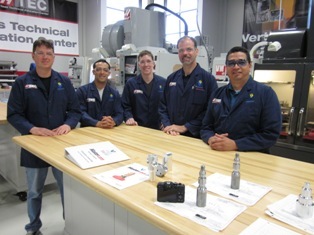 After completing the machinist program, graduates will come to Stark Industries to put their new skills to work. "To be able to have someone go through a program like this and come to us definitely with the basics helps us, because we can put those people right to work," Darrel Zeck Director of Business Development at Stark Industries said. The fact that those employees are veterans is an added bonus. "Being dedicated to work attention to detail all of those things are taught in any branch of the Armed Forces. Getting that caliber of person to come through this program we really end up with nice results," Zeck said. "Before i was going nowhere. Nowhere jobs no growth potential and this came out of the blue and it's like changed my life," Auberry said.